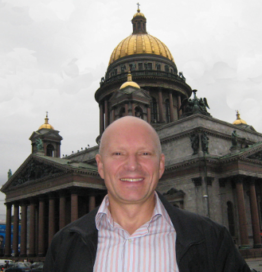 Professor Konstantin G. Korotkov, has had very extensive experience in both the health and computer science fields, serving as a member of research boards (St. Petersburg Federal Research Institute of Physical Culture, Federal Russian University Scientific Board on new medical technologies, “Journal of Alternative and Complementary Medicine” and the “Journal of Science of Healing Outcomes”); Professor of Computer Science and Biophysics at St. Petersburg Federal University and Professor of Research in the St. Petersburg Academy of Physical Culture; CTO of the “Energy Information Technologies, Inc” and as a Consultant for Estee Lauder and Aveda Co. Prof. Korotkov is considered one of the top experts on new medical technologies. He has published over 200 papers based on his findings of over thirty years of research, and holds 17 patents for inventions in the biophysics field. His commitment to a rigorous use of the scientific method, together with an insatiable curiosity regarding spiritual matters are demonstrated in his outlook on life and health, and expressed during lectures, seminars, and training sessions that he has presented in 43 countries. Professor Korotkov has also written nine books, most of which are available in several languages including English, French, German, Italian and Spanish. Notable among these are: Light after Life: Experiments and Ideas on After-Death Changes of Kirlian Pictures, USA 1998; Aura and Consciousness – New Stage of Scientific Understanding, Russian Ministry of Culture, 1998; Human Energy Fields: Study with GDV Bioelectrography, USA 2002. Spiral Traverse, (USA?) 2006; as editor of the book: Measuring Energy Fields: State of the Art, GDV Bioelectrography series, USA 2004. Prof. Korotkov was elected President of the international Union of Medical and Applied Bioelectrography (IUMAB) by some of the world’s most important researchers in 2001; he is currently acting in that capacity, having been re-elected in 2005 and 2010. He is also a member of the Federal University Scientific Board on new medical technologies, of the Scientific Board of the European Society of Predictive Medicine and of the Editorial Board of the “Journal of Alternative and Complementary Medicine”. He has created a scientific line called Electrophotonics which permits a specialist to view human energy fields, facilitating the diagnosis of bodily imbalances and dysfunctions. This technique, based on Gas Discharge visualization is recognized by the Russian Ministry of Health as a viable medical technique and is certified in Europe.